Amazon Lightsail makes it easy to secure your websites and applications with SSL/TLS using Lightsail load balancers. However, using a Lightsail load balancer might not generally be the right choice. Perhaps your site doesn't need the scalability or fault tolerance load balancers provide, or maybe you're optimizing for cost. In the latter case, you might consider using Let's Encrypt to obtain a free SSL certificate. If so, that's no problem. You can integrate those certificates with Lightsail instances. This tutorial shows you how to request a Let’s Encrypt wildcard certificate using Certbot, and integrate it with your WordPress instance using the Really Simple SSL plugin. To learn more about SSL/TLS certificates in Lightsail, see SSL/TLS certificates in Lightsail. Create a WordPress instance in Lightsail. To learn more, see Create an Amazon Lightsail instance. Register a domain name, and get administrative access to edit its DNS records. To learn more, see DNS in Amazon Lightsail. We recommend that you manage your domain’s DNS records using a Lightsail DNS zone. To learn more, see Creating a DNS zone to manage your domain’s DNS records in Amazon Lightsail. Use the browser-based SSH terminal in the Lightsail console to perform the steps in this tutorial. However, you can also use your own SSH client, such as PuTTY. To learn more about configuring PuTTY, see Download and set up PuTTY to connect using SSH in Amazon Lightsail. After you've completed the prerequisites, continue to the next section of this tutorial. 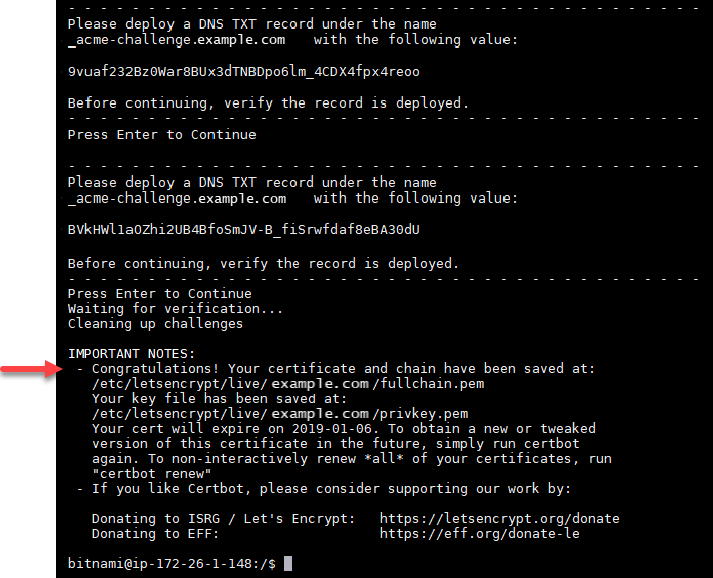 Certbot is a client used to request a certificate from Let’s Encrypt and deploy it to a web server. Let's Encrypt uses the ACME protocol to issue certificates, and Certbot is an ACME-enabled client that interacts with Let's Encrypt. Sign in to the Lightsail console. On the Lightsail home page, choose the SSH quick connect icon for the instance that you want to connect to. Enter the following command to install the software properties package. Certbot’s developers use a Personal Package Archive (PPA) to distribute Certbot. The software properties package makes it more efficient to work with PPAs. If you encounter a Could not get lock error when running the sudo apt-get install command, please wait approximately 15 minutes and try again. This error may be caused by a cron job that is using the Apt package management tool to install unattended upgrades. Certbot is now installed on your Lightsail instance. Keep the browser-based SSH terminal window open—you return to it later in this tutorial. Continue to the next section of this tutorial. Begin the process of requesting a certificate from Let’s Encrypt. Using Certbot, request a wildcard certificate, which lets you use a single certificate for a domain and its subdomains. For example, a single wildcard certificate works for the example.com top-level domain, and the blog.example.com, and stuff.example.com subdomains. In the same browser-based SSH terminal window used in step 2 of this tutorial, enter the following commands to set an environment variable for your domain. You can now more efficiently copy and paste commands to obtain the certificate. Be sure to replace domain with the name of your registered domain. Enter the following command to start Certbot in interactive mode. This command tells Certbot to use a manual authorization method with DNS challenges to verify domain ownership. It requests a wildcard certificate for your top-level domain, as well as its subdomains. Enter your email address when prompted, because it’s used for renewal and security notices. Read the Let’s Encrypt terms of service. When done, press A if you agree. If you disagree, you cannot obtain a Let’s Encrypt certificate. Respond accordingly to the prompt to share your email address and to the warning about your IP address being logged. Keep the Lightsail browser-based SSH session open—you return to it later in this tutorial. Continue to the next section of this tutorial. Adding a TXT record to your domain’s DNS zone verifies that you own the domain. For demonstration purposes, we use the Lightsail DNS zone. However, the steps might be similar for other DNS zones typically hosted by domain registrars. 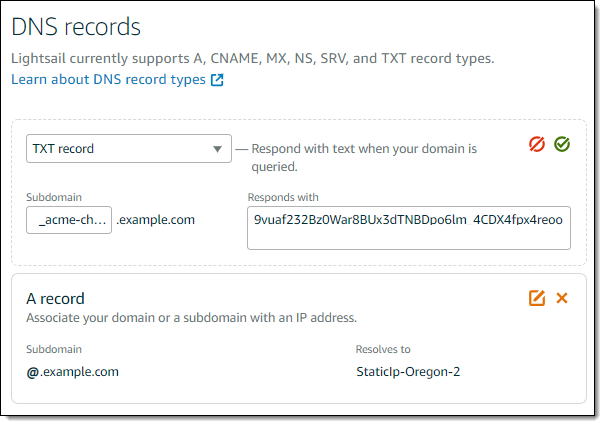 To learn more about how to create a Lightsail DNS zone for your domain, see Creating a DNS zone to manage your domain’s DNS records in Amazon Lightsail. On the Lightsail home page, choose the Networking tab. Under the DNS zones section of the page, choose the DNS Zone for the domain that you specified in the Certbot certificate request. In the DNS zone editor, choose Add record. In the record type drop-down menu, choose TXT record. Enter the values specified by the Let’s Encrypt certificate request into the Subdomain and Responds with fields as shown in the following screenshot. Repeat steps 3 through 6 to add the second set of TXT records specified by the Let’s Encrypt certificate request. Keep the Lightsail console browser window open—you return to it later in this tutorial. Continue to the next section of this tutorial. 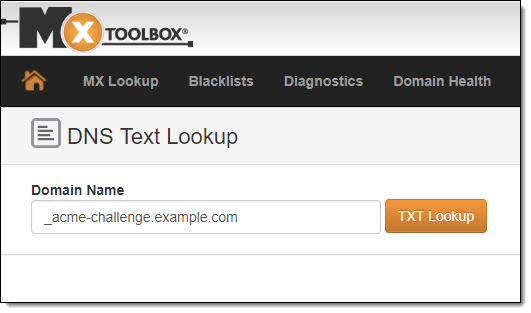 Use the MxToolbox utility to confirm that the TXT records have propagated to the internet’s DNS. 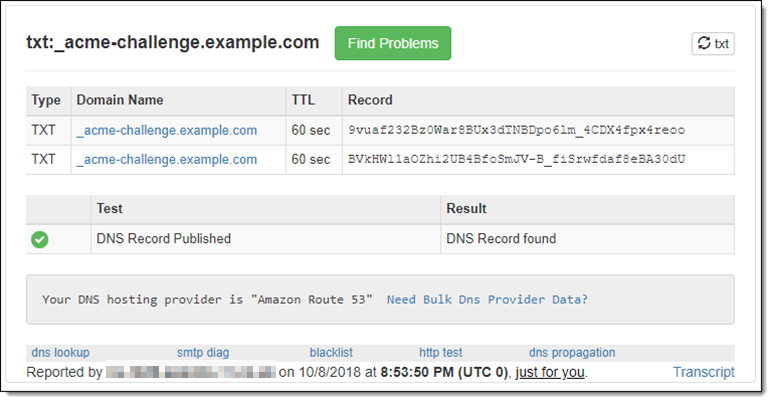 DNS record propagation might take a while depending on your DNS hosting provider, and the configured time to live (TTL) for your DNS records. It is important that you complete this step, and confirm that your TXT records have propagated, before continuing your Certbot certificate request. Otherwise, your certificate request fails. Open a new browser window and go to https://mxtoolbox.com/TXTLookup.aspx. Enter the following text into the text box. Be sure to replace domain with your domain. Choose TXT Lookup to run the check. If your TXT records have propagated to the internet’s DNS, you see a response similar to the one shown in the following screenshot. Close the browser window and continue to the next section of this tutorial. If your TXT records have not propagated to the internet’s DNS, you see a DNS Record not found response. Confirm that you added the correct DNS records to your domains’ DNS zone. 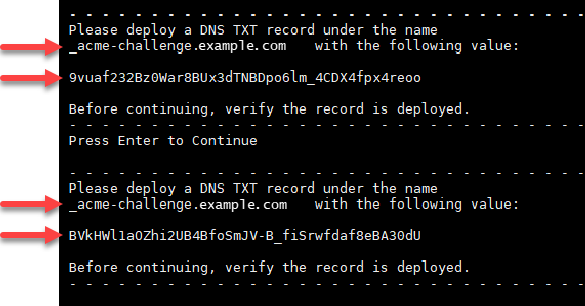 If you added the correct records, wait a while longer to let your domain’s DNS records propagate, and run the TXT lookup again. Go back to the Lightsail browser-based SSH session for your WordPress instance and complete the Let’s Encrypt certificate request. Certbot saves your SSL certificate, chain, and key files to a specific directory on your WordPress instance. The message confirms that your certificate, chain, and key files are stored in the /etc/letsencrypt/live/domain/ directory. Make sure to replace domain with your domain, such as /etc/letsencrypt/live/example.com/. Make note of the expiration date specified in the message. You use it to renew your certificate by that date. Now that you have the Let’s Encrypt SSL certificate, continue to the next section of this tutorial. Move your new Let’s Encrypt SSL certificate files to the Apache server directory on your WordPress instance. Also, back up your existing certificates, in case you need them later. Enter the following command to set an environment variable for your domain. You can more efficiently copy and paste commands to move your certificate files. Be sure to replace domain with the name of your registered domain name. The SSL certificate files for your WordPress instance are now in the correct directory. Continue to the next section of this tutorial. Install the Really Simple SSL plugin to your WordPress site, and use it to integrate the SSL certificate. Really Simple SSL also configures HTTP to HTTPS redirection to ensure that users who visit your site are always on the HTTPS connection. In the Lightsail browser-based SSH session for your WordPress instance, enter the following command to set your wp-config.php file to be writeable. The Really Simple SSL plugin will write to the wp-config.php file to configure your certificates. Open a new browser window and sign in to the administration dashboard of your WordPress instance. For more information, see Getting the application user name and password for your 'Powered by Bitnami' instance in Amazon Lightsail. Choose Plugins from the left navigation pane. Choose Add New from the top of the Plugins page. Search for Really Simple SSL. Choose Install Now next to the Really Simple SSL plugin in the search results. After it’s done installing, choose Activate. In the prompt that appears, choose Go ahead, activate SSL! You may be redirected to the sign in page for the administration dashboard of your WordPress instance. Your WordPress instance is now configured to use SSL encryption. Additionally, your WordPress instance is now configured to automatically redirect connections from HTTP to HTTPS. When a visitor goes to http://example.com, they are automatically redirected to the encrypted HTTPS connection (i.e., https://example.com).